HomeBlogMore news – Badger Bioneers, possible energy project! More news – Badger Bioneers, possible energy project! I’m writing a quick post before heading off to an informal meeting with people running local businesses to brainstorm more about our connection between timebanking, price-based mutual credit, paper currency and community saving and lending projects. After that meeting we’re having a Build a Better World Game session. We’re about to release that into the world more. Whitney will be playing the game in different Madison neighborhoods through December. And next week I have the honor of presenting at the Badger Bioneers conference as one of the 5 chosen Badger Bioneers for 2012. We celebrated at a dinner last night, hosted by Grant Abert and Tina Frailey of Kailo Fund and Sustain Dane (of which Grant was a founder) and IronWorks Cafe at Goodman Center. It was really lovely. On Thur. December 13 I’ll give a 20-minute talk, then serve on a panel, then play a short set of music later in the day. More on Badger Bioneers here. One more thing I’m extremely excited about: We met with folks from the Allied Community Coop yesterday and there’s lots of enthusiasm for pursuing a human-scaled economic development project there oriented around reducing fossil fuel use. We might have the perfect opportunity to test out our theories that connecting several pieces in one neighborhood might really make things fly. I hope so! I’m excited to try. We’ll continue to explore our ideas at the Dec. 13 Builders Workshop (big day I know! 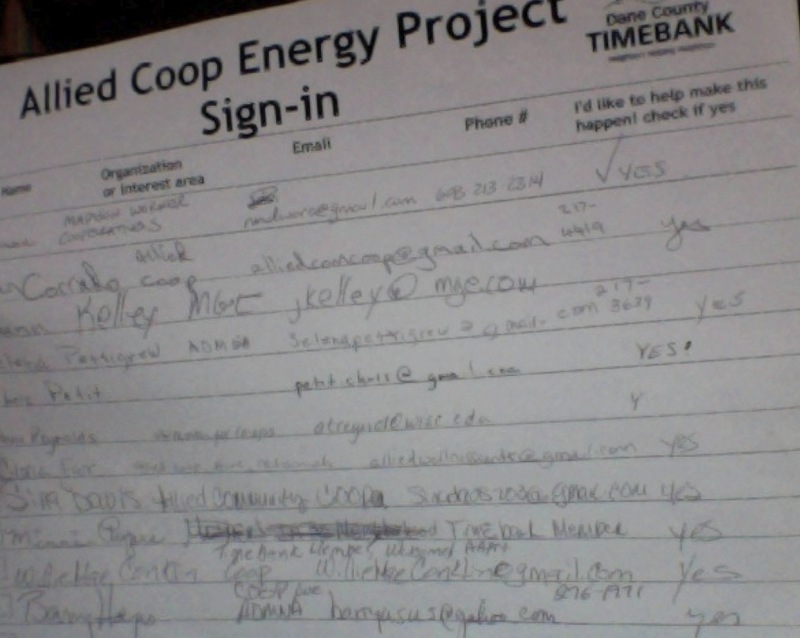 ), TimeBanking and Cooperatives: Better Together? If you want to join us online please give me at least 24 hours advance notice at steph@stephanierearick.com. Sharing Builders Workshop #8: TimeBanking and Cooperatives: Better Together?